Runner Shawn Gulati trades spikes for wheels, biking cross-country to support affordable housing. For two summer months, Shawn Gulati '08 was off his feet and on a seat, pumping pedals and wearing out wheels for charity. A regular on Kenyon's cross country and track rosters, Gulati temporarily set aside his running spikes to join Bike and Build, an organization that challenges its members to assist in affordable housing efforts while on cross-country cycling treks. Riders for Bike and Build mounted up in mid-May near Virginia Beach, Virginia, and embarked on a journey that encompassed more than three thousand miles, through thirteen states, with a final stop in Cannon Beach, Oregon. Each person in Gulati's thirty-member team had to raise $4,000 in advance. And each could bring along no more than a small duffle bag crammed with essentials. Gulati's group also included Shannon Deoul '08. And they are not the first Kenyon students to participate. Caitlin Wells '06 rode with Bike and Build in 2003, while Kaitlin O'Malley '07, Amy Thurber '07, and Maggie Rosen '05 rode in 2004. Gulati, a self-proclaimed endurance junkie, got interested while rehabbing a knee injury. "The stationary bike was getting old and I needed something more," he says. "From that point on, things kind of evolved." During the transcontinental excursion, Gulati and his fellow riders were expected to churn out an average of eighty miles a day. And so they pedaled, and pedaled--sometimes slowly, to admire a waterfall in West Virginia; sometimes frantically, to avoid rough spots in downtown Cincinnati. And sometimes they could simply let the wheels spin, enjoying the ease of a downhill slope in the Rocky Mountains. Periodically, the group would stop to work on predetermined housing projects. They built sheds, hauled gravel, framed houses, and put on roofs. The nature of the trip, however, made it virtually impossible to map out a detailed plan from day to day. The one question they could always count on was where to eat, sleep, and shower. Campgrounds, churches, and community centers became one-day homes. If the temporary shelters could not provide a meal, then another unscripted bike ride would follow, one that usually ended at a fast-food franchise or a family restaurant, where a big-hearted manager was often willing to feed the group for free. 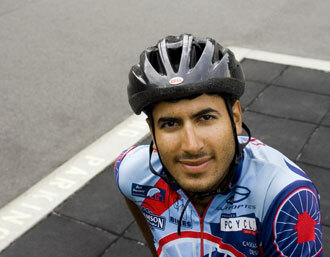 Between biking and building, Gulati and his cycling partners became public-relations specialists, coaxing donations for the cause and establishing connections for possible lodging or nourishment. They learned to rely not on cell phones, navigation systems, or the Internet, but on the help of strangers. "To a point, I enjoyed the reclusive life," says Gulati, a New York City native. "Many times I had no idea what day it was or what was going on in the world. But honestly, after a while it was tough. I'm one of those people who have to check my e-mail ten times a day." Small trips within the big trip were inevitable. The riders would have to look for laundromats and post offices, seek out directions, and hunt for recreational spots like putt-putt courses for team bonding or libraries in which they could spend some catch-up time on a computer. It was during some of that downtime that Gulati came to appreciate something about the nature of need and generosity. While he was giving to the less fortunate, he in turn relied on others for his basic needs. The trip was remarkable, he realized, not only for the biking challenge, the scenery, and the experience of building homes for others, but also, quite simply, for the encounters with people. It was the people that overwhelmed Gulati. "It was a real eye-opening experience for me in terms of how willing people are to give for a cause," he says. "It's very different from what I'm used to. Throughout the trip, I was amazed by the generosity that overflowed from complete strangers."